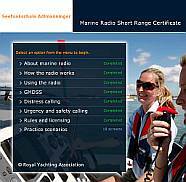 Once you have completed all the exercises of the SRC online course, you can run Step 2: Pre-exam knowledge check on the RYA Interactive Site and then download your course completion certificate in Step 3. Then, you can take the SRC exam. In addition to these dates, we can also organise your SRC exam on an individual basis.